With the arrival of winter last weekend, we had to rearrange our schedule and start trailing the heifers to our winter range. 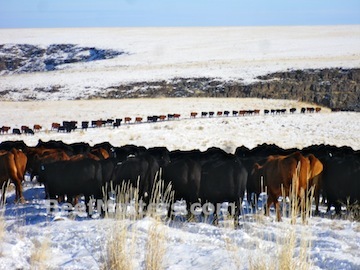 In the fall, after we wean our calves, we start combining smaller groups of cows into larger bunches for the winter. In this bunch we have our replacement heifers and our first-calf heifers. 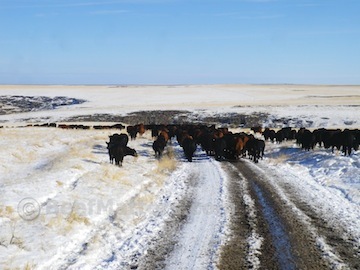 Creating these large groups of cows makes it easier to move them and to care for them throughout the winter. This group of heifers requires the most care. They will be calving for the first or second time in just a few months, so their nutritional requirements are higher than our other cows. We try to make sure they get a little more TLC, and that includes being the first group of cattle to move to the winter range! It took all day to trail them from the six inches of snow they were standing in to their new home with only two inches of snow. The kids are out for Thanksgiving break and are hoping to do some cowboying over the next few days. Boy, are they in luck! The old cows and our group of solid red cows are still waiting to move to the winter range. I love school breaks, it gives us a chance to put the kids to work! We have a TLC bunch also! In this group are the 1st calf heifers, 2nd calvers and really old cows. Last Saturday we had 2-3 inches of snow. We desperately needed the moisture to settle dust. Each day gets a little warmer and the Hubby said they are calling for 50 today. That is rare in my part of South Dakota. Last year for Thanksgiving we traveled on ice and it was below zero.